Is your dog fond of digging in your yard? Is it driving you mad? Is your garden looking like a bombs gone off? Are you at your wit's end? Don't worry - we're here to help you! The first thing to remember is that dogs never dig to just be bad or to spite you. Simply, digging is in their nature. Dogs in the wild dig to create dens in order to protect and raise their young - keeping them out of harm's way and avoiding exposure to extreme weather conditions. Domestic dogs still carry out this behaviour by choosing to sleep in den like places or 'digging' and circling an area before they lie down. Chances are, you've noticed your dog do this too. However, just because it's in their nature, it doesn't mean you have to sacrifice a lovely landscaped yard. By figuring out why your dog digs, you should be able to implement methods to hopefully stop the behaviour altogether. Is your dog alone a lot of the time, lacking playmates or many toys, under three years of age or a terrier, herding or sporting breed? If you've answered yes to one or more of these then maybe your dog is digging for entertainment. Going for extra walks, teaching tricks, going to obedience classes or providing more challenging or interactive toys are some great methods to adopt to curb your dog's boredom related digging. Does your dog dig in localised locations, concentrating on trees and/or shrubs? Then it appears your dog may be digging for prey. The best thing you can do is to try and identify if there are animals coming into your yard and then look for humane ways to deter them. Does your dog dig near buildings, water sources or in shaded areas, doesn't have their own outdoor shelter, or using holes as places to lie in - then these are indicators that your dog is digging to seek out protection. To combat this, give your dog more access to the indoor areas of your home, particularly when you are experiencing extreme weather. In addition, give your dog a lovely dog house that is sturdy enough to offer adequate protection during hot, cold, wet and/or windy weather. And, always have plenty of fresh water available. If you witness your dog brazenly digging in front of you or perhaps you don't often get to see your dog due to long work hours then it's possible your dog's digging is as a result of a lack of attention. If this is the case, it's important to ignore this behaviour and only lavish them with attention when they are being a good dog to reinforce acceptable behaviour. You may also need to re-think your routine and try and fit in time every day to spend with your dog - taking them for walks, playing games and giving them plenty of attention. 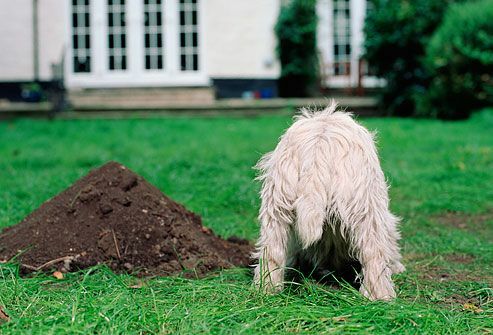 If the holes your dog digs are near, along or even under the fence then it might be a signal that your dog is digging to escape. Crucially, you will need to figure out why your dog is trying to escape. Is it to reach something attractive, to try and go somewhere, or to avoid something? Understanding and removing this incentive is how to avoid further digging. Once you've done this, you will also have to put in place better security measures so your pooch doesn't get away for real. Using chicken wire, large rocks or chain links buried along the fence are all good ways to help prevent any escaping from occurring but always be sure you don't leave sharp edges poking out. If after all of this, your digging dog is still prevailing, then you could potentially consider creating a 'digging zone,' an acceptable area of your yard where it is ok for your pooch to dig till their heart's content. To do this, you will need to make the area look attractive by burying toys and giving plenty of praise when they do dig in this area. A very important point to remember is to never punish your dog for unwanted digging. Rather than teaching your dog, punishment only increases the likeliness they will continue their digging. Also, remember to avoid using fertilisers, which can be attractive to dogs, as this can be harmful to your pet's health.